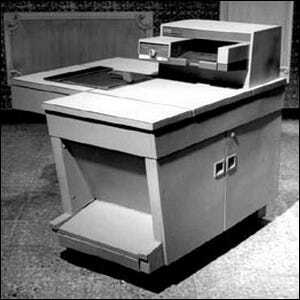 Cameras Hidden In What Office Equipment Helped The U.S. Gain Access to Soviet Secrets? At the peak of the Cold War, the United States was desperate to gain high level access to Soviet secrets in the name of squeaking out an edge in the conflict. While some rather wild ideas were pitched (and even brought into development) such as building a bionic cat with microphones embedded in its body, none were as successful as a Trojan-horse style attack on the Soviet embassies and facilities using, of all things, the unassuming photocopier. It all began in 1961 when CIA agents realized that the Soviet Embassy was on complete lock down with only Soviets with high clearance entering and leaving. The only chink in the embassy’s armor was the Xerox repairman. Early copy machines were revolutionary but they were finicky beasts and required lots of routine maintenance and refilling by a trained technician. The CIA realized the repairman was the key. They approached Xerox vice-president John Dessauer and pitched their idea: putting miniature cameras in all the copy machines in order to photograph every document the Soviet clerks photocopied for the agents and embassy staff. Xerox got behind the project and the CIA bought a small bowling alley near one of Xerox’s largest factories. Inside that bowling alley turned Cold War research facility, Xerox engineers devised as perfect an espionage tool as any spy agency could hope for: a camera that fit nearly invisibly inside the complex innards of the popular Xerox Model 914 copier, photographed every single copy made, and stored the negatives so the copier technician could easily swap them out as part of his routine maintenance on the machine. The program was so successful that eventually the CIA slipped the photocopy-cameras into every copier in every embassy around the world. The project continued until 1969 when, by pure chance, an American company was discovered using the same tactic while engaged in corporate espionage against a rival company. After the scandal hit the news the CIA pulled the plug on the operation fearing for the safety of agents and technicians carrying out the film swaps. Although the program was prematurely terminated, during the time it was active the CIA acquired tens of thousands of classified documents that gave the United States a decisive edge in navigating the politics and conflicts of the Cold War.